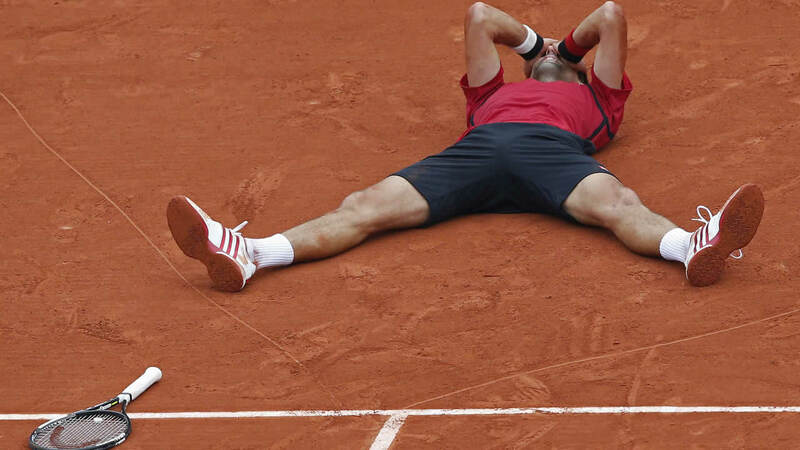 PARIS -- Novak Djokovic became the first man in nearly a half-century to win four consecutive major championships and finally earned an elusive French Open title to complete a career Grand Slam, beating Andy Murray 3-6, 6-1, 6-2, 6-4 on Sunday. When his victory was over, Djokovic used a racket to etch a heart in the red clay that had given him such heartache in the past and dropped down on his back. On Sunday - the weather overcast but dry, unlike so much of the rainy past two weeks - the first choruses of "No-le! No-le!" accompanied Djokovic's entrance to the court. They returned when an announcer introduced Djokovic during the warmup period. And again when he skipped from sideline to baseline to receive in the opening game - and, louder still, when Djokovic broke two-time major champion Murray to start. All in all, it sounded as if this were Belgrade, rather than a neutral site, and Murray complained that fans were calling out between his first and second serves. The spectators really raised a ruckus when Murray served for the first set and put one right near a line. It was called a fault by a linesman and immediately overruled by chair umpire Damien Dumusois, who climbed down to inspect the mark. He confirmed it was a fault, then declared Murray led 30-love. Djokovic, already convinced there should have been a double-fault there, maintained the point should be replayed. Dumusois wasn't buying it. The crowd booed and whistled loudly, delaying play for a full minute, an odd interlude in a Grand Slam final. Soon enough, Murray closed that set. As Djokovic bowed his head, Murray ran backward to the changeover chair, pointing at his right temple. Aside from the first game, Murray was perfect in that set as he tried to become Britain's first male champion in Paris since 1935. Djokovic, meanwhile, was off - jitters, perhaps? - and particularly so with his forehand, to the tune of seven unforced errors on that wing before Murray made one. Maybe, just maybe, Murray exhaled a tad too much after grabbing the set. Djokovic certainly found a reserve of resolve. The dynamic shifted completely. Murray's first-serve percentage dipped and he quickly fell behind 3-0. Now it was Djokovic who was the domineering one, deciding the terms, yanking an increasingly exhausted Murray this way and that across the baseline with just the right shot at just the right moment and creating a 24-6 edge in winners across the second and third sets. When Djokovic slid to reach a drop shot by Murray and somehow crafted a cross-court backhand winner at an impossible angle to go a double-break up in the third at 4-1, the Serb raised his right index finger - "I'm No. 1!" - then sat at the sideline and raised a clenched fist. Djokovic broke again to begin the fourth set, and his long, arduous journey to history was soon complete.